Certainly we all know the saying “seeing is believing.” Surely, we’ve all used it at some point to describe something we’ve heard is spectacular, terrible, otherworldly, whatever, but couldn’t really grasp until we saw or experienced the thing in person. A lot of people use that same line of thinking to explain their lack of belief in a religion or a god or a higher power or aliens or scientific theory. That “seeing is believing” thing had a profound impact on me the first time I saw Salt Lake City-based duo Eagle Twin perform live. Before that, I had their first record “The Unkindness of Crows” on which to base my judgment, and while I was intrigued by the recording, there was a bit of a disconnect. I wasn’t quite sure about the throaty vocals, the compositions were really muddy but had a hint of something more beneath the surface, and the content certainly was pretty different from most other bands out there. I mean, the album title pretty much summed up what the songs were about. Luckily, I caught the band before they opened for Sunn 0))) in Pittsburgh, and the experienced changed the way I felt about the record. The power and mystery and passion behind the music that I heard so many people describe, I finally felt and realized in person. The whole thing really sunk in at that moment, and the pieces fell into place. Next day, I listened to “Crows” again, and lo and behold, the record started to capture me. It still was weird and unconventional, but that started to become a positive. I was getting it. No other band sounds like Eagle Twin at all, their unorthodox artistry is something I’ve grown to appreciate and admire. Since my live journey with the band, I’ve had people hear the record over my shoulder or in my home and kind watched them furl their brow. Yeah, I was there before. Then I saw what I needed to see, and now I believe in it. So it was with great anticipation that I greeted the band’s second record “The Feather Tipped the Serpent’s Scale,” and just like their first, it didn’t fully register. But unlike their debut, this one unraveled quickly for me, and just a couple visits with this record, I was fully immersed, soul and spirit. This record is incredible, one of the best Southern Lord releases of the last few years, and every time I listen, I get more involved and more excited by what’s coming out of my speakers. It’s a gigantic step ahead. The story itself spills over from the tragic conclusion to “Unkindness,” where the crows documented on that collection tried to battle the sun and were sent burnt back to earth. 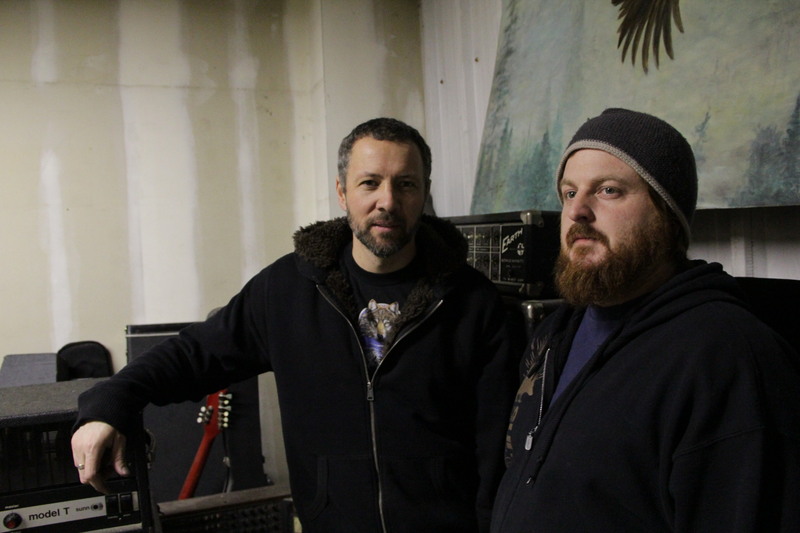 Now they take snake form, and the Eagle Twin fellows – guitarist/vocalist Gentry Densley, drummer Tyler Smith — take time to examine the role of serpents throughout time, in stories and human history. With the multiple references to Adam, the Garden of Eden comes into play as well as the Biblical assertion of sin into humankind. But there’s plenty more going on as well that looks at spiritual and mythical background of snakes, and it gives the whole thing an even darker, more sinister edge. The album opens with the incredible “Ballad of Job Cain” parts 1 and 2 that sprawl over nearly 20 minutes and never fail to be anything but captivating. The songs are bluesy, doomy, and smoking, and Densley switches back and forth from a thick croon to a gravelly growl, depending on where he’s at in the story. My wife pointed out that the growls remind her of a mix of Tom Waits and Dr. Teeth from “The Muppet Show.” She doesn’t listen to metal, so let’s give her a pass on that one. “Lorca (Adan)” is based on a piece by Spanish poet Federico Garcia Lorca, with the lyrics based on the English translation of that work, and musically they delve into Midwestern terrain. It sounds like they’re channeling Dylan Carlson and their soon-to-be-tourmates Earth and shows a whole different sonic side of the band. Here, the Book of Genesis-based fall from grace story is recalled in bloody detail in a way perhaps you haven’t heard before. That theme also seems to spill into “Snake Hymn,” where Densley, over bluesy riffs and searing drone, howls about “the snake in the garden” as the band then transcends to an incredibly emotional terrain. The song is flushed with color, as they imagine a paradise built on snakes, and it flows headlong into “HornSnakeHorns,” the record’s shortest non-instrumental track. This, too, hits a dusty trail, a Southwestern finish, and vocals that are yowled with character and expression. It sinks into doomy tar and eventually bleeds into interlude “It Came to Pass the Snakes Became Mighty Antlers,” a thorny, pushy scene-setter. Closer “Epilogue, Crow’s Theology” begins mystically before settling into a slow-driving pace with guitars that hang like a haze, thick, burly riffing, and at the end, a solitary drum beat that closes the book on our tale. 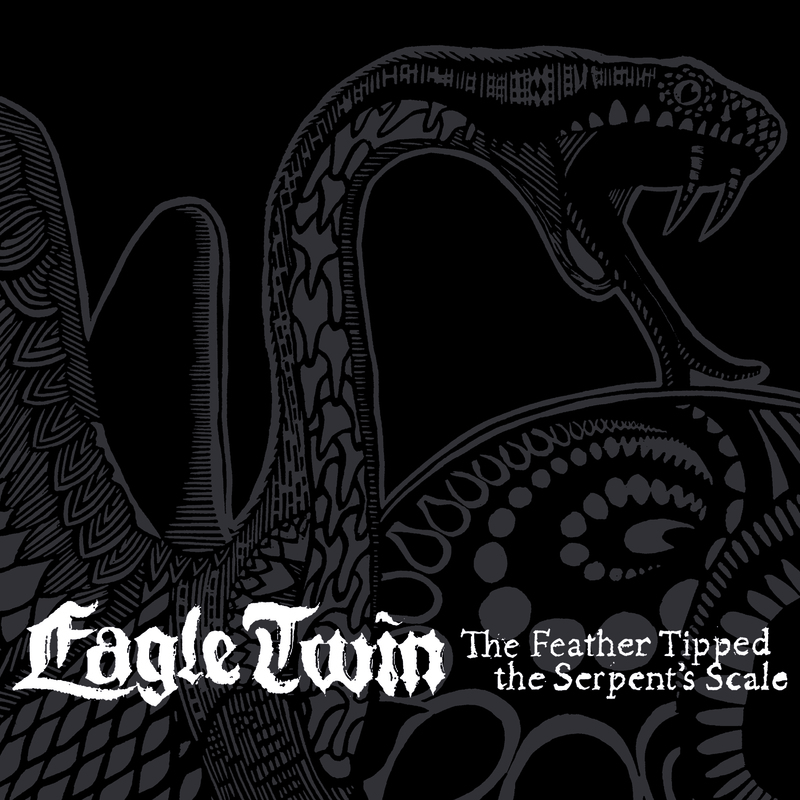 Eagle Twin already had built a nice level of respect in the underground metal scene, but this one should wake up anyone who’s been asleep on this band. “The Feather Tipped the Serpent’s Scale” is a record that catapults Eagle Twin from an intriguing doom-based band to one that’s about to become a major and unique force. This record still is one that may take some people unfamiliar with the band some time to understand. Once you do, the venom sets in and you’re finished. That’s a good thing, by the way.